Pak 162/10 in 43.1 overs Ind 164/2 in 29 overs. 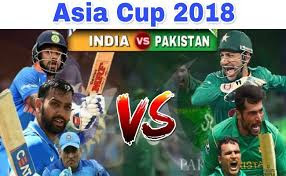 India vs Pakistan high voltage match of Asia Cup 2018 being played in Dubai International Cricket Stadium Dubai on 19 Sep 2018. This is the 5th match of this tournament. Hi friends, In this blog post I am about to give preview, prediction and live cricket score of this high voltage Ind vs Pak 5th ODI match of Asia Cup 2018. The Indian team will go with some changes in this match. Jaspreet Bumrah and Hardik Pandya will play in this match. Lack of Virat Kohli may affect the team performance but Rohit Sharma is also a capable captain and support of the previous captain MS Dhoni must give strength to the team. India will meet with Pakistan in this high voltage battle after more than one year. In June 2017 India have had lost the final match against Pakistan in Champions Trophy in which match Hardik Pandya has had played a great inning but unfortunately got run out due to Ravindra Jadeja and India lost that match. Pakistani batsmen Fakkar Jaman is on fire. He did 3 century and a half-century in the last 5 ODI matches. Shikhar Dhawan, Rohit Sharma, Ambati Raydu, MS Dhoni, Hardik Pandya, Jaspreet Bumrah, Yajuvendra Chahal, Kuldeep Yadav, Bhuwneswar Kumar, Kedar Jadav, Dinesh Kartik. Imam-ul-Haq and Fakhar Zaman started the inning for Pakistan but couldn't do well due to best bowling by opening bowlers Jaspreet Bumrah and Bhuwneswar Kumar. Both bowlers bowled very well and got the wickets of opening batsmen 3 overs. B Kumar got the wickets of both opener batsmen Imam-ul-Haq 2 and Fakhar Zaman 0. Babar Azam 47 and Shoaib Malik 43 played well for Pakistan. Kuldeep Yadav got 1 wicket but Kedar Jadhav did amazing bowling and got 3 wickets. After 35 overs the score of Pakistan was 134/7. A piece of bad news for India, Hardik Pandya got injured during bowling and went out from the field with the help of stretchers. Rohit Sharma 52 and Shikhar Dhawan 46 played a blasting inning. Ambati Raydu and Dinesh Kartik also supported with the 31-31 runs to win this Ind vs Pak 5 ODI match of Asia Cup 2018. India won this one sided match by 8 wickets.